Techfloyd: How To Fight With Malware ? Techfloyd: How To Fight With Malware ? In Today's Information Technology era online activities are not safe if you are not taking proper precaution while browsing . In our daily life we heard many cases about online fraud such as theft of credit card no. , Bank Account details etc. you can get a very Good article inside of this blog which is (Info About Social Engineering and It's prevention) and other useful article under title " Article on Internet Security and Safety" inside of this blog. if we look at 10 year back we can see that Internet changes our life dramatically ,from online shopping to Online Banking , from travelling to booking of movie tickets etc, every thing got online today.this huge growth of Internet also attracted social criminal ( Hacker) to theft personal information of people and use those info for their personal profit, what it may be , if you are not aware about basic Internet security and safety then it could be very harmful for you on Internet . In this article you will know about Malware, Malware have many definition the simplest definition of Malware is ,. Malware is short for " Malicious Software " refer to any software specifically designed to harm your computer or the software it's running without the owners informed consent . software is consideredMalware based on the perceived intent of the creator rather than any particular features. 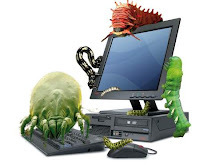 Malware includes computer virus , Worms , tojan horses most rootkits , spyware , dishonest adware ,crimeware and other Malicious and unwanted softwares . Malware can be added to your computer , without or with your knowledge , it happens usually when you visit a website containing Malware or when download innocent content . it can then slow down your system , send fake e-mails from your account , steal sensitive information life Credit Card no, Bank account details or password from your computer and more. A recent research from Internet giant Google suggest that an increasing no. ofMalware attacks are tacking place on site , you had normally regard as safe or legitimate , but have actually been compromised . Google works closely with the with the security community to identifyMalware on the web and then share that information more broadly . if you are searching on Google and click on a link that Google have flagged , a warning page will appear before you move forward. Google also notify webmasters if Google discover that a site is no longer secure and provide a method forwebmaters that clean up their sites to request a review . and starting soon, Google will be providing more detail on site that appear on spreadingmalware , so user have a better sense of why we have flagged a given site and webmasters can more easily identify and correct on their sites. Like Google and other organization putting their great efforts in this regard but this is also our responsibility that we use apply method by which we can secure our self. Follow the the following tips to secure yourself from Malware. 2.Always use latest version of Operating system and web browser. Attackers generally target vulnerabilities i n your operating system to install malware on your computer , so always use latest version of operating system and web browser. operating system and web browser provides frequently release updates to close those vulnerabilities . enable automatic updates for both your browser and your operating system, and check for alerts to ensure you have the latest and greatest protection. Whenever you are prompted to download an e-mail attachment , install a plug-in or download an familiar piece of software . take a moment to think about , is downloading from this site is secure ? The Perfect Combination " LinkedIn +Twitter"